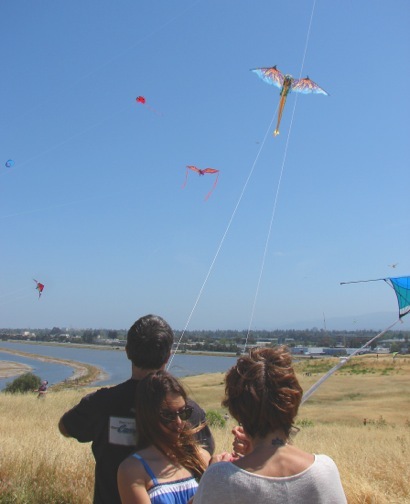 Lots of sunshine and great breezes made near perfect conditions for Menlo Park’s Kite Day, held yesterday at Bedwell Bayfront Park. Matt Milde, Recreation Coordinator of Menlo’s Community Services department estimated more than 600 people attended, outpacing last year’s attendance by about 100. Among the participants was Carleen Bedwell and her son. 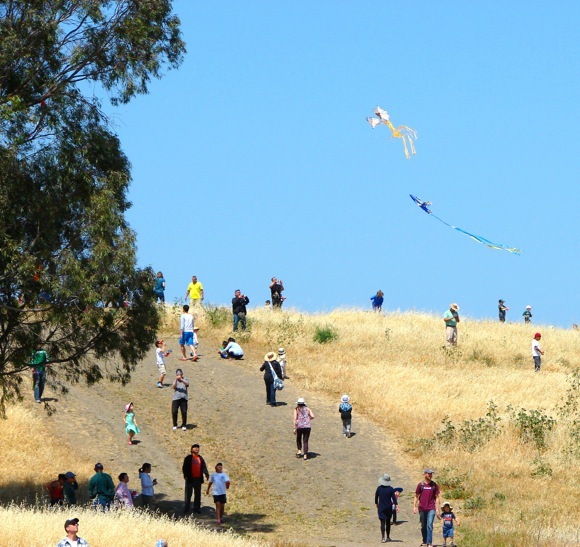 As described by the City, “…Bedwell Bayfront Park was created after a landfill was closed and capped off in the mid-1980s…In 2009 the City of Menlo Park renamed Bayfront Park to Bedwell Bayfront Park in honor of Michael Bedwell, who served as Menlo Park City Manager from 1964 to 1990. The Menlo Park Kiwanis sponsored the event and handed out more than 500 hot dogs!